The most influential player in the 2018 NBA playoffs has yet to attempt a shot. I wish I could claim that I was referring to Joel Embiid, the man currently known as the Phantom of the Process. Embiid clearly has the potential to place near the top of any list of “important” players, but the absurdly athletic and constantly entertaining center still has only regular season accomplishments to his name. Besides that fact, the most influential player I was referring to has arguably cast such a long shadow over the sport, that his performance over the past three years seems to have inspired the league’s young seven footers to work on their long distance shooting as much as their post games. With apologies to the process, I’m talking about Steph Curry. Curry has been missing from the action long enough that the Houston Rockets closed the gap to become near co-favorites to win the title. The Warriors have only lost one playoff game out of their last 19. Yet, FiveThirtyEight, while leaning (too?) heavily on regular season data, has only just moved them from seventh to third in their ELO rankings. Back-to-back blowouts of their weakened rivals from San Antonio have barely jogged the culture’s collective short memory. The focus on the recent success of the regular season is understandable given how much information everyone now consumes on a daily basis. Honestly, it has been so long since we last saw Steph nonchalantly go 5-9 from beyond the arc and sit down on the bench looking a bit bored of it all that I almost miss the sight of his absent-minded mouthguard chewing. Almost. That part is still weird as hell. Still, there could be another reason, besides their point guard’s absence, that the Warriors are a borderline afterthought. It could be the fact that, now, nearly every other team attempts to play the same style of basketball that they perfected. The 2018 playoffs are still quite young, but as of this writing, every team has shot at least 20 three pointers in 14 out of 16 games. The league appears to have fully transformed. If someone said they preferred the style of, say, the 2004 Detroit Pistons, they would immediately be called out for trolling. That Pistons team defeated their playoff opponents by an average score of 87-81 in ’04, which now sounds like the score of an exciting college game that went to overtime. These trends make the narrative of a closing gap between the NBA’s higher and lower playoff seeds seem enticing. If scoring is up all around and it’s mostly due to increased prioritizing of open three point attempts, then surely every team is more vulnerable to losing every night? The problem for the underdogs is the playoff format. A best-of-seven series favors the more talented team, and if jump shooting is more important to team offense than ever before, then it makes sense to pick the better jump shooting team to win a series. Field goal percentage differential is the the gap between the percentage of shots a team makes and the percentage of shots their opponent makes. 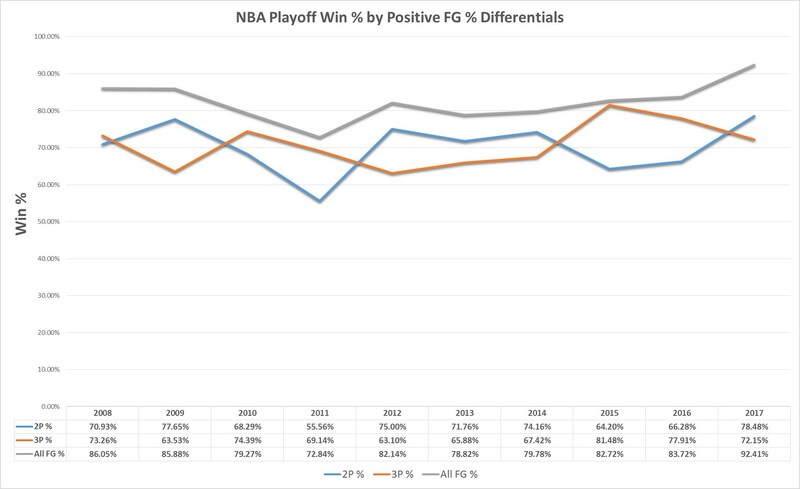 For the record, Golden State just led the league in FG% differential for the fourth straight regular season, and teams who have a positive FG% differential in an NBA playoff game have won 82% of the time over the past 10 years. That percentage does not drop after controlling for games in which both teams attempt 20+ three point shots, either. The NBA has always needed more parity, so the current sentiment that the playoffs are more wide open than ever feels refreshing. On one hand, there are more up-and-coming teams, they all play smarter basketball than the lower seeds of years’ past, and the rising television ratings clearly show that young stars and fresh storylines drive up interest in the game. On the other hand, maybe none of those narratives matter. Maybe, this entire postseason still will come down to which team sinks the long ball at a greater rate than their opponents. If that is the case, I find it hard to bet against the team with the best shooter of all time. As a Sixers fan, it should feel great at this point that Embiid can be mentioned in this opening paragraph at all without anyone writing me off as a total homer, but I know I’m far from the only fan in Philadelphia hungry for more success after the recent run of good fortune. The exceptions were the Milwaukee Bucks in Game 2 vs. Boston, who looked lost whenever Giannis Antetokounmpo was unable to make an acrobatic layup, and the Timberwolves, who lost by 20 points in Game 2 of their series to a Rockets team that attempted 52 three pointers. Based on data from the Elias Sports Bureau. Well, if he comes back healthy.